Luxury Adventures are doing a series of interviews with some of our key suppliers looking at the different aspects of their lives and how these influence the experiences they offer. Te Arai is a new luxury Lodge located 2 hours north of Auckland on the North Island, New Zealand. Tell us how the lodge at Te Arai came to be? Our family have holidayed in the Te Arai / Mangawhai area for decades and fell in love with the rolling hills, the white sandy beaches and all of the wonderful produce grown in the area. We bought our land 15 years ago, a north-facing block surrounded by over 20 acres of ancient podocarp forest and native bush with stunning rural and distant sea views out to the islands along the coast. We immediately knew that this was the right place to build our dream home / lifestyle business; a very special property to share with family, friends and guests. We started construction 3 years ago and have lived on site, initially in a caravan, working hands-on overseeing every aspect of the project from design to build and personally planting over 4,000 trees, shrubs and plants. Vince, you and Kathy have had an interesting history, tell us what you both bring from your past lives to make Te Arai special? We both share a love for travel, adventure, meeting new people and sharing. I am a chef by trade and both Kathy and I have worked in the hospitality business around the world for over 35 years. We are passionate foodies and I also love my wines, showcasing over 60 NZ wines in my cellar on offer for our guests at Te Arai Lodge. Kathy is also passionate about her garden and growing her own organic produce. She is also a Yoga, Tai Chi and Body Balance instructor with over 15 years of experience. I see from your website that the whole family are involved in the running of the lodge, talk to us about what involvement your daughter Nicola and sons Douglas and Harry have in the day to day running of Te Arai Lodge: Our daughter Nicola is the Lodge Manager, multilingual host and passionate garden-to-table chef. Her background is in design, romance languages and gastronomy, having attended high school and university in various parts of Italy and completed her masters thesis in Italian on the history of food at The University of Bologna in Italy. She has since worked in the food industry and as a recipe developer in Paris, Milan, Madrid, London, Stockholm, Copenhagen, Wellington and Auckland, written several recipe books with Green Kitchen Stories in Sweden and presented a travel food series with World Nomads in Spain. Recently she returned home with much enthusiasm and knowledge after having worked in the kitchens and permaculture gardens of some of the world’s top wellness retreats such as Gwinganna in Australia, Aro Hā in New Zealand and Stedsans in the Woods in Sweden. Our eldest son Doug is in charge of our website, marketing, social media and new initiatives. He is a qualified yoga instructor, a keen golfer and cyclist, and fitness guru who runs yoga and movement classes for our guests. Our son Harry is a musician, artist, photographer and fly fisherman who offers guests trout guiding experiences around New Zealand and saltwater fly fishing in our local waters. What activities and experiences are there on offer at the lodge and surrounding area? There is a Cook School, which we talk more about below. 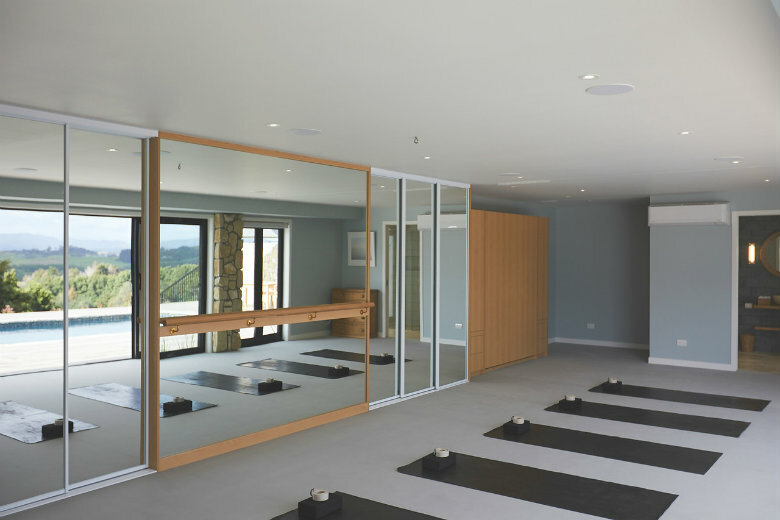 Yoga & Movement: The classes, taught by Kathy, her son Doug and world-class guest teachers include a range of Hatha, Vinyasa, Tai chi, Qi Gong, Yin Yoga and dynamic body weight movement. Our open level classes are perfect for those just starting out in yoga or movement, or for those who have been practicing for some time. The focus of our classes is to align body and mind and leave you feeling rejuvenated. After class you can enjoy an organic tea and bliss ball in our beautiful studio overlooking the saltwater pool and podocarp forest for a truly trans-formative experience. Massage & beauty treatments: The lodge offers a full range of massage & beauty treatments in the comfort of your own room or in the serene poolside Yoga Studio. Bird Watching: A sustained pest eradication programme over the past 15 years, together with the planting of over 4000 native shrubs, trees and plants, has transformed the surrounding landscape and the ancient podocarp forest into a haven for our native birds. The lodge has been positioned to sit into the top of the ridge line giving a magnificent vantage point over the treetops and surrounding bush. The experience is like being up in the forest canopy with the birds. Binoculars are available in each guest suite for guests’ use during their stay together with bird books to identify and observe the birds in their natural environment. Te Arai Lodge is a proud sponsor of NZ Forest & Bird with a percentage of our profits being donated annually to this iconic NZ institution. Surfing, SUP’s and Kayaking: The lodge has Stand Up paddle boards (SUP’s), kayaks and life jackets available for guests’ use at no additional charge and, by arrangement, will drop guests off at a number of suggested locations to suit their skill levels and preferences. Surf boards and surfing lessons can be arranged at an additional charge. Hiking: The Mangawhai and Te Arai region boast a wide range of walks to meet every skill and fitness level. From short 20 minute walks with rewarding panoramic views over the inner estuary to more challenging cliff and bush walks. Take a strenuous hike up a range of waterfalls through native bush to an ancient Kauri dam or a more leisurely walk around the estuary or a stroll along some of the region’s amazing white sandy beaches. Routes and itineraries can be custom-made to guests’ requirements with maps and directions provided. Guided walks can be arranged together with picnic packs and provisions by prior request. Golf: Te Arai Lodge is located 10 minutes’ drive from the Mangawhai Golf Club, one of NZ’s top 20 Championship Golf Courses. Mangawhai Golf Club is kept in great condition throughout the year with a superb sand base, free draining fairways, native flora and spectacular views. Cycling: Lodge owner Vince is a passionate cyclist and has first-hand knowledge of both sealed road and off-road routes in the region. He has cycled, self-supported, down the Pacific Coast Highway from northern Canada to Mexico and recently completed the grueling Tour d’Afrique tour from Cairo in Egypt, through 10 African countries, to Cape Town in South Africa, an Epic 12,000 kilometre adventure over a 5 month period! Mountain bikes and helmets are available to guests, at no charge, with routes tailored to guests’ requirements and fitness levels. A unique experience is to cycle along the 9 kilometre Te Arai beach at low tide, an unforgettable experience. Sports Fishing: Fish the stunning Mokohinau Islands, located 25 miles off the coast of Mangawhai Heads, for the famous yellowtail kingfish and trophy Snapper. In the warmer months, off the Mokohinau Islands, fish for striped, black and blue marlin for an unforgettable NZ experience. Also available in the area are snorkeling, and diving, wine tasting, a visit to Bennetts Chocolate factory, Farmers markets at Matakana, sculpture parks, and more. Tell us more about the garden-to-table dining experience at the lodge? “Garden-to-table” is the essence of the food offering at Te Arai Lodge, using organic produce grown on the estate complemented with fresh local produce, line-caught fish from Leigh, organic free-range chicken, grass fed-beef and more. The style of cuisine at Te Arai Lodge is crafted around the seasonality and freshness of the produce, letting the natural flavours tell the story… tantalizing entrées, memorable meals, mouth-watering desserts and experiences to last a lifetime. The “Shared Dining” evening meal experience invites guests to join with the Moores family and fellow guests. Guests can choose to source produce from the gardens with the chef, to observe or partake in the finishing touches of the offerings or to simply relax by the open fire on the terrace with a drink, to then be invited to share a communal table for dining. Alternatively, guests can choose a “Private Dining” experience and have the various courses of their meal served in a location of their choice around the property. 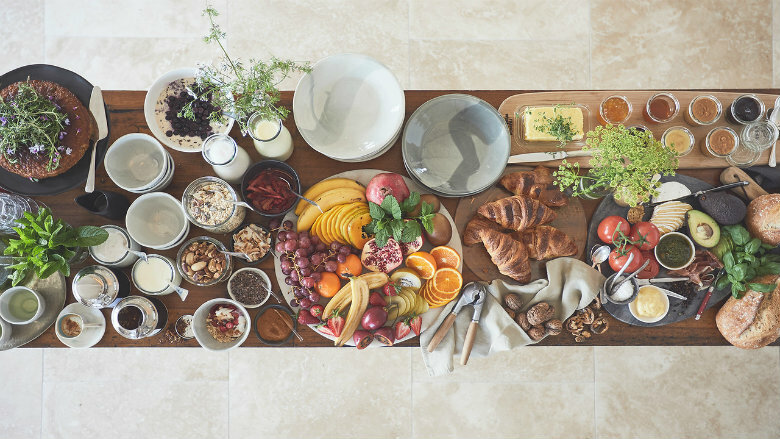 Breakfast is served buffet style, together with a choice of hot dishes cooked to order. Again, guests have the option of shared or private dining locations. The “Cook School” sounds really cool, talk us through what guest can expect of this experience: By prior arrangement, on a Saturday morning guests are taken to the local Matakana Markets to choose a selection of organic produce and to personally meet a number of our local suppliers. Returning to Te Arai Lodge, guests will harvest supplementary organic produce from the seasonal dishes tailored to guests’ wishes, picking up on useful tips and various cooking techniques along the way. The day culminates in a long lunch enjoying the prepared fare served with local wines. What style of accommodation is on offer at Te Arai, and what type of guests is it suited to? The Lodge caters to wide range of guests, at different price points, with rooms ranging from generous private suites to a cosy mezzanine loft. Level entry and adjacent parking facilitates ease of access. Whilst we do not normally cater for children under 16, subject to bookings and by prior arrangement this facility can be entertained. A “Whole of House” booking allows guests to book the property for young children and family members without any restrictions. Kererū Suite: Framed by towering purpleheart timbers, the entrance to the Kererū Suite pulls you in to a luxurious room inspired by the local flora and fauna. With breathtaking views over the native bush, you can listen to and watch the birds fly by from the comfort of your bed or whilst enjoying a cup of tea or glass of wine by the fire. 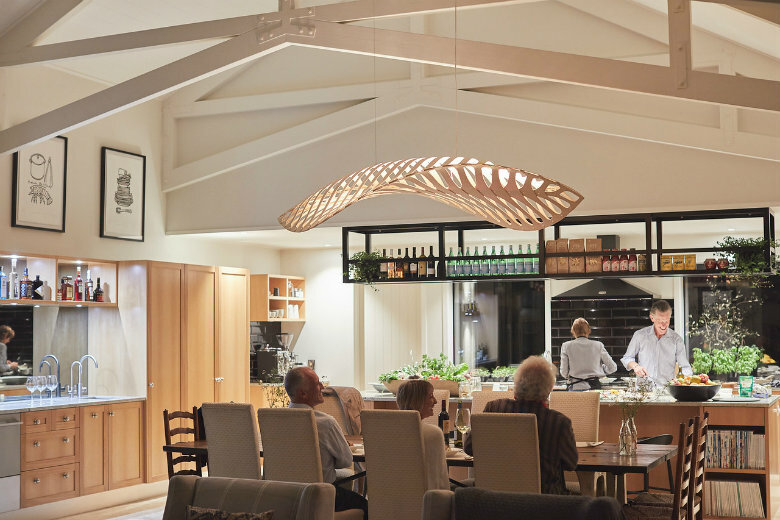 Kererū Suite is fully self-contained with adjacent parking and a separate outside entrance with an internal connection to the main lodge through the adjoining library. It comes equipped with a gas fireplace, air conditioning and a complimentary minibar, tea and coffee making facilities and a private dining area. In addition to the beautifully appointed double vanity ensuite, there is a generous outdoor bath tub on the adjacent private deck in which to sit and watch the sun set surrounded by nature. 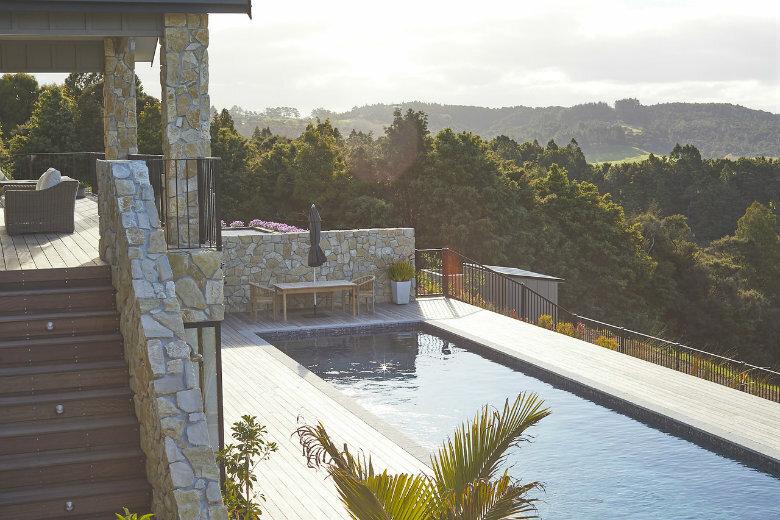 Tūī Mezzanine: Nestled at the top of the lodge, the Tūī Mezzanine is the perfect spot to bird watch and take in all the breathtaking views out over the Tuscan-style rolling hills, to the beach and beyond. It is intimate, luxurious and inspired by the bird life that frequently fly by. Entering through into the main lodge foyer, the striking staircase leads up to the Tūī Mezzanine with ensuite, air conditioning and complimentary minibar facilities. Black Dog Barn: The striking Black Dog Barn is a blend of the iconic Kiwi shed with a contemporary studio interior. 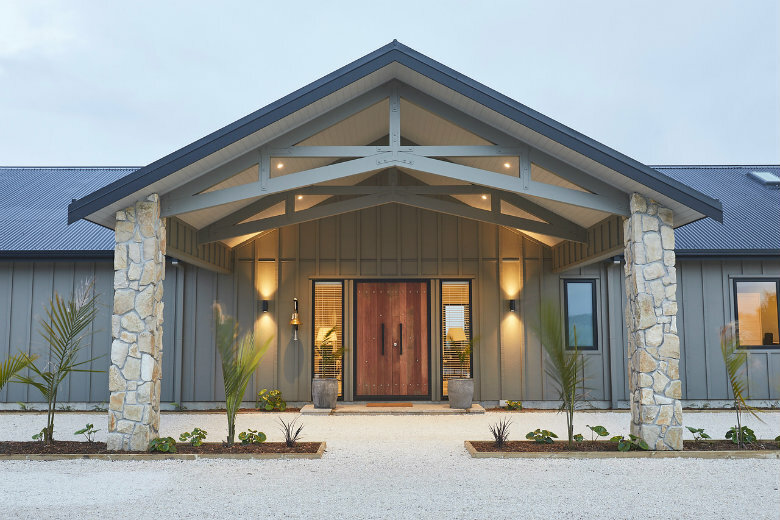 Set directly across from the main lodge, Black Dog Barn supports an impressive 42 solar panels to sustainable power the lodge framed with a purpleheart timber entry pergola. It features a generous double-height studio with views out to the orchard and native bush. A generous limestone paved courtyard provides the perfect location to watch the sun set, sitting around the open fire brazier. Black Dog Barn is fully self-contained with its own separate entry, ensuite, kitchenette and walk-in wardrobe featuring an outdoor shower, complimentary minibar, private dining facilities and a central wood-burning fireplace. What inclusions should guests expect in their nightly tariff? Other than Northland, of course, which three other destinations would you consider as not to be missed on a two week itinerary around New Zealand? Taranaki, Hawkes Bay & Wanaka. Nicola Moores Lodge Manager of Te Arai. You can read more about them here.